When you outsource your practice’s medical billing, it can help you improve finances by maximizing claims payments and keeping your practice compliant. If you’re aware of this and considering outsourcing your podiatry practice’s billing, here are the top 3 things that will help you make an informed decision. It is critical that the medical billing company is familiar with podiatric procedures and codes. Ask whether they have podiatry practices as existing clients. Ensure that the medical billing company has certified, trained and experienced medical coders and billers. Outsourcing your podiatry billing should make your operations more efficient. So, it is important that the billing service you hire is compatible with your current EHR software. This is useful because that means you do not need to have your office staff re-trained on a new software. To learn more about physicians billing service, call one of the top medical billing companies, Emerald Health LLC at 855-650-9906 Today. 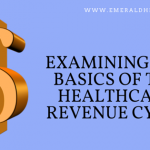 Emerald Health provides comprehensive, reliable and complete revenue cycle management.